We learned our lesson last Saturday and did not stay out too late last night. Mehrl, whom I've known since I was a teenager, passed away earlier this year, and a memorial service was held for him yesterday. I was reminded that early on in Claire's life, her father and I had asked Mehrl and his wife to raise Claire for us if something happened to the two of us. That summarizes how much we thought of them, what great people and how much love is in our hearts. He was the kind of guy who tracked each of his friends, a guy who remembered family members, work situations, in short, he remembered lots of details and nuances of friends. And always asked, always stayed in touch. A great, solid, lifelong friend. A gift in a life. He had one of the most beautiful singing voices I've ever heard. Lots of musician friends, lots of great voices lifted up last night, joining together to sing some of Mehrl's favorites...and to make a joyful noise. I'll miss that sweet souled man. It will be tougher on his immediate family: his sister and her husband, their kids and Mehrl's wife and their 2 lovely daughters will feel the loss every day, will miss him dearly. His lifelong friends held him close in their hearts, close in their esteem, close in their actions. 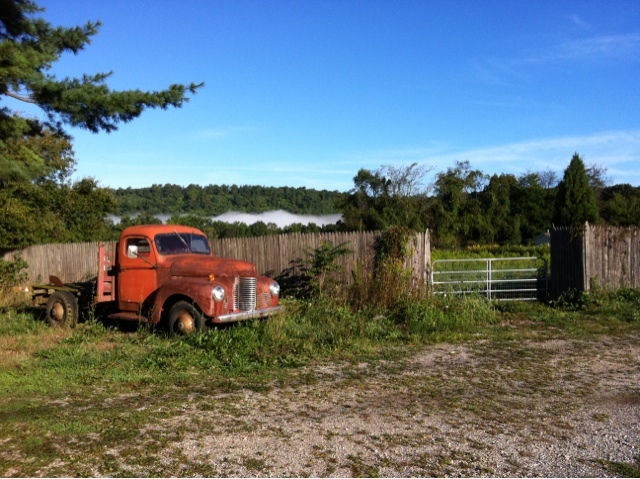 Early morning, the sun rises, the fog rolls in, the flatbed truck that was brand new when Mehrl first walked.